The rear tail gate & windshield have been completely tinkered to get it's original state. I was searching for a spare tailgate and I couldn't source, initially in a dilemma to do the tinker work but after the professional touch on the tailgate I'm so confident that the tailgate is as like as the stock one. In addition to the above two parts, the front grill and radiator holders are also completely done and they are up to their original state. As I could source the OE muffler (The equipment used to reduce the noise emitted from exhaust pipe), the JEEP is going to be a silent macho machine, isn't that interesting. 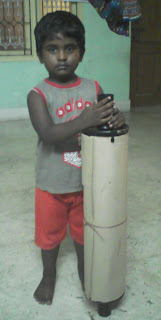 The picture here shows my son holding the newly purchased muffler. As I couldn't visit the garage last week there was a gap in the blog about status update. Though I couldn't post the pictures, the metal pasting work has been completed and the surface of the jeep looks neat. The new body bolts and the rubberized body bed also been installed properly.